This is probably my favorite signed 2008 Goudey that I own. While I have a few cards from the set signed by some bigger names, I also have other cards signed by those guys that I enjoy more. 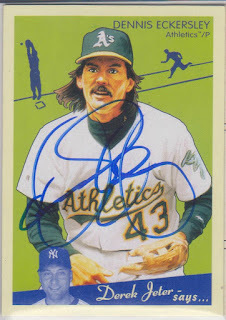 But, this one, on the other hand, is the only card that I have signed by Bobby and I absolutely love it. Plus, the fact that it is a mini makes it that much better. 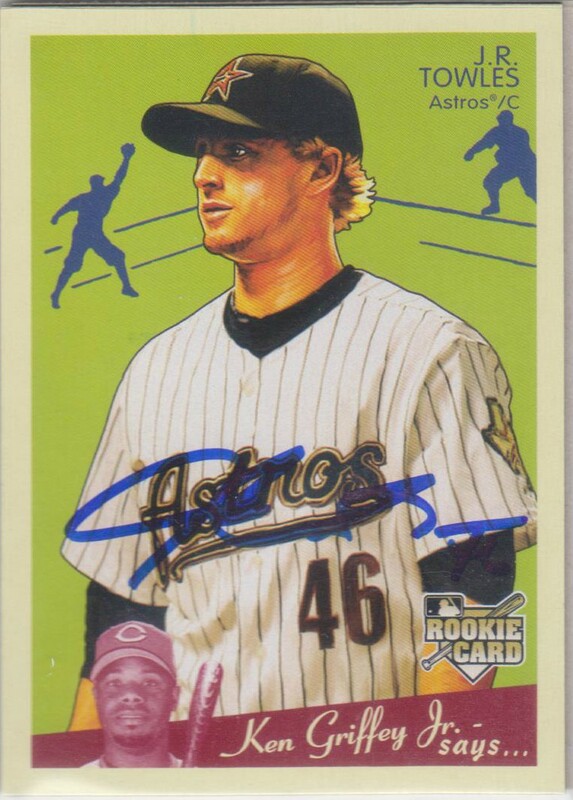 I got this card signed through the mail in November of 2008. 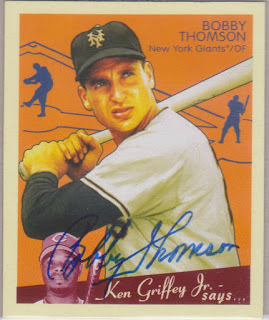 In fact, over a four day stretch that month, I got back Bobby Doerr, Sparky Anderson, and this card, all from this set. That was a fun week of checking the mailbox. Bobby had a fifteen year career in the Majors, playing with the Giants, Braves, Cubs, Red Sox, and Orioles. He was a .270 career hitter that racked up 264 home runs and 1,026 RBI. He made three All Star teams, had four 100 RBI seasons, played in one World Series, and hit one of the most iconic home runs in baseball history. I didn't notice it on the Doerr or Anderson cards, but it just seems off to see Ken Griffey on the front of this card. I love that Upper Deck put Griffey and Jeter on there to replace Lou Gehrig, but it just doesn't work on cards that feature players that played before Griffey, Sr. played. This is one of the two cards that I got signed by Chris Young at Royals Fanfest in 2017. The other card I had him sign was his 2016 Topps card that showed him celebrating the Royals World Championship, which was a must for a Royals fan. 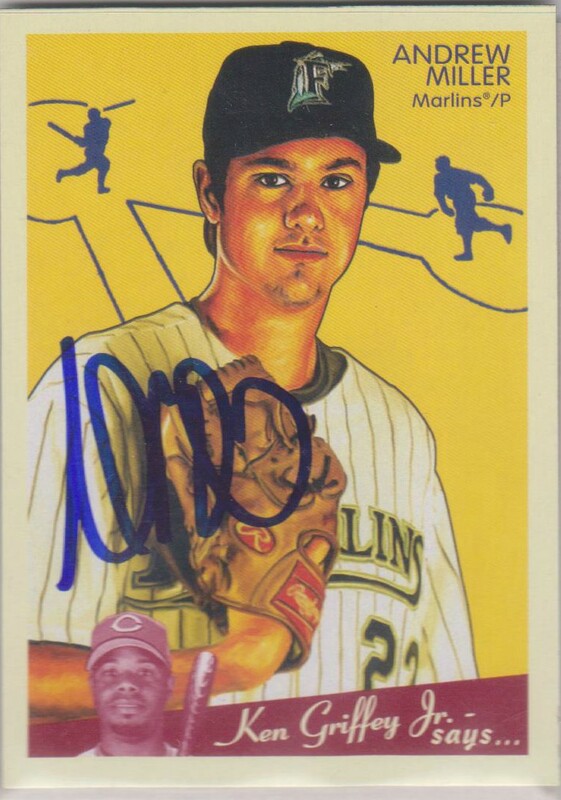 I had one other card with me that day of him, his 2008 Allen & Ginter. I asked my wife which one I should get signed and she wisely chose this one. 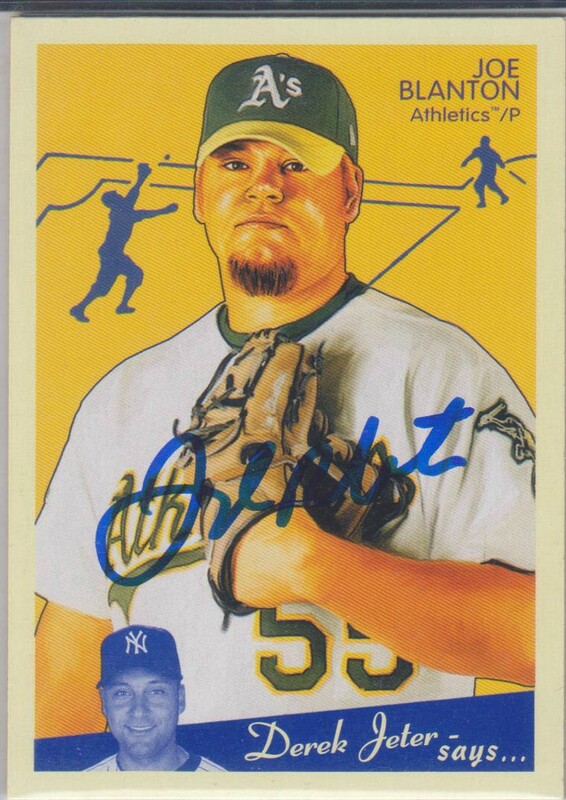 Chris pitched in the Majors for thirteen seasons with the Rangers, Padres, Mets, Mariners, and Royals. Over that time, he had a 79-67 record with a save and a 3.95 ERA in nearly 1300 innings of work. He appeared in the postseason twice and made one All Star team. Chris probably had his best season during the 2007 campaign with the Padres. While his record wasn't great (9-8), he did post a 3.12 ERA and stuck out a single season best 167 batters. Coincidentally, that was the one year he made the All Star team. While I wasn't a huge Chris Young fan during his tenure with the Royals, especially after his first season, I absolutely love his signature. It is actually readable, which is a rare trait anymore. 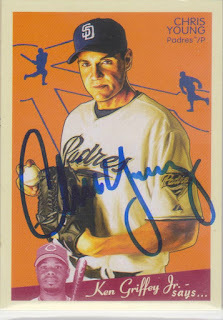 Here is a card that I got signed in Kansas City during Joe's brief stay with the Royals. It was a Sunday day game, which is autograph day at The K. Like most everything else that the Royals do that is autograph related, the event is poorly ran. You have to get to the park early so that you can make it into one of the two lines. Of course, you have no clue who is going to be signing, so it is a total crapshoot. Once you are in line, you have to stand there for thirty minutes before the players come out. Then, they only sign for about twenty minutes. On this particular day, I got in one line and my wife and kid got in the other. The dude in my line ended up being a reliever that didn't have any cards. So, I got out of line. The other line had someone I needed, so my family stayed in it. Since it was autograph day, I didn't bring my book with me. I put my cards in two hard cases so I could split them up between the two lines. So, once I got out of line, I was free to head down to the field and try to get some of the pitchers out there. Joe ended up being the only guy that I got and I only had this one card in my case. 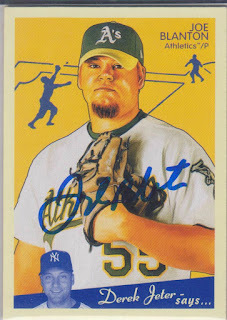 But, that is alright since this is probably the best Joe Blanton card that I own. Joe lasted in the Majors for thirteen seasons and saw time with the A's, Phillies, Dodgers, Angels, Royals, Pirates, and Nationals. Over that time, he amassed a 101-97 record with 2 saves and a 4.38 ERA. He last pitched in the Majors in 2017. 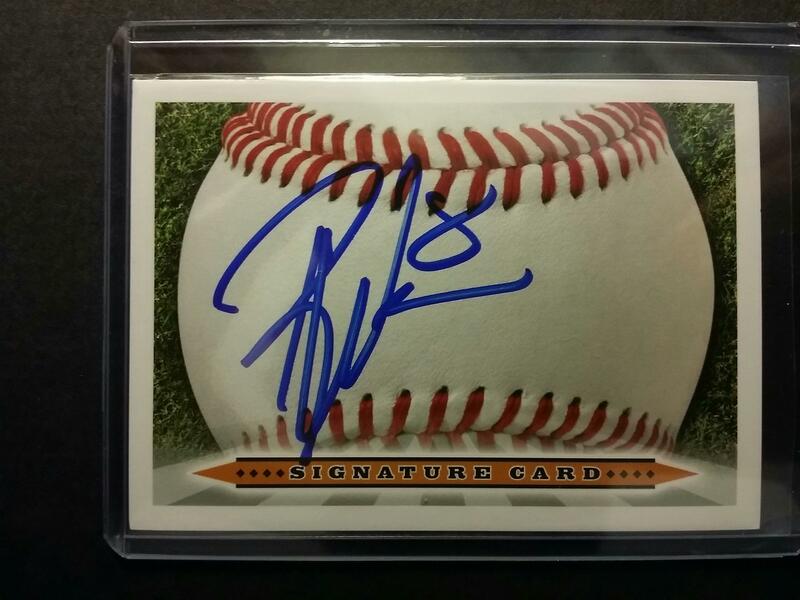 Here is a card that I got signed by Ian Kennedy at a Royals game in 2012. Ian was with the D-Backs at the time and I had a rough outing on the 'graphing front that day. As it turned out, Ian was the only guy I got. 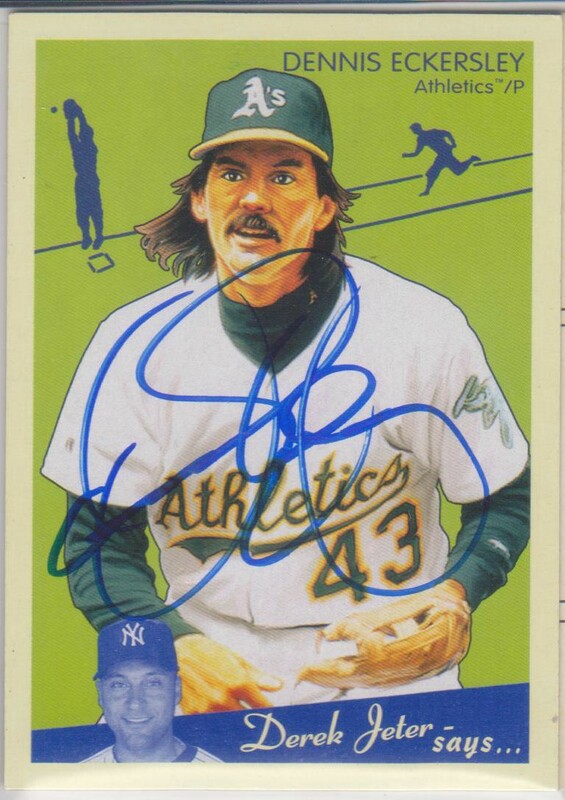 But, he did sign all three cards that I had of him, so it could have been much worse. And, considering that he was a year removed from a 21 win season, it was a good autograph to get at the time. Fast-forward seven years later and now Ian isn't that great of a grab. After two very disappointing years in the Royals rotation, Ian has been sent to the bullpen this season. Minus the money the Royals are paying him, it is a move that I like. Last season, Ian did fairly well during his first time through the line-up. But, things weren't as good the second time around and they got even worse on the third trip through the order. So, the demotion made sense to me. As it stands right now through the Royals first twelve games of the season, Ian has been the most constant reliever in an awful bullpen. Hopefully, he can keep it up. Speaking of Royals games, I went to one today and got to see the bullpen blow another lead en route to their tenth straight loss. On top of that, the 'graphing was nearly non-existent. The Royals open up the outfield an hour and a half before first pitch, but you cannot head down by the field until an hour prior. During the thirty minute gap, there were six Mariner pitchers on the field getting their work in. Two minutes before you could head down by the field, they all went back into the clubhouse. Booooo. But, I was able to snag three from Royals pitching coach Cal Eldred and three from the M's starting catcher, Tom Murphy. So, it could have been worse. This card is another example of how I somehow manage to get autographs from future Royals players. Here is a card that I got signed at a Round Rock Express game in 2008. JR was the starting catcher that night for the Express and would not sign on the way to the field, since he had to get his pitcher warmed up. But, on the way out, he stopped and signed for everybody after the game. He signed all three cards that I had of him. JR spent parts of five seasons playing for the Astros. Over that time, he got into 155 games and he hit .187 with 11 home runs and 50 RBI. When JR initially got called up in 2007, he went on a mini-terror. Though he played in just 14 games and had just 40 at-bats, he would hit .375 with 5 doubles, 1 home run, 12 RBI, and only strike out once in the process. Unfortunately, he could never replicate those numbers again. JR signed this card in about the worst spot possible. But, what are you going to do? 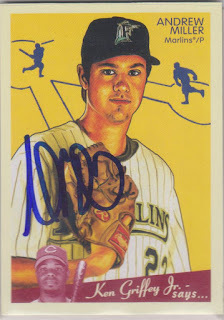 Here is card that I got signed in Kansas City last summer. Andrew was playing for Cleveland at the time and I was lucky enough to catch him as he was dropped off at the ballpark. Andrew was a total class act and signed for everybody on his way in. 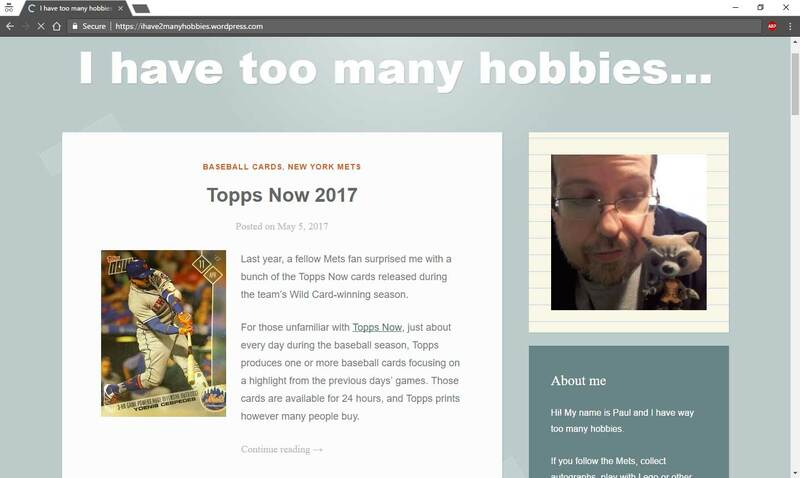 He signed this card and his 2018 Topps Heritage card for me. 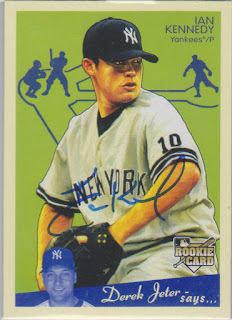 By the time this card came out, Andrew, once a highly touted prospect, was looking like he was a bust. He was in his third season of pro ball and on his second team. Through his first two seasons, he was 5-6 with an ERA of 5.69 while walking 49 and striking out 62 in 74.1 innings of work with Detroit. Things didn't get any better in Miami. In his first season with the Marlins, he was 6-10 with a 5.87 ERA. It was more of the same in 2009 and he then spent most of 2010 in the minor leagues. The Marlins then flipped him to Boston for Dustin Richardson and it was more of the same in 2011 with the Sox. Then, in 2012, Boston moved Andrew to the bullpen full time and things started to click. Used as a LOOGY that first year in the pen, Andrew posted a 3.35 ERA over 40.1 innings. In 2013, he had his first season of more than a strikeout an inning. In 2014, he had his first 100 strikeout season and did it in just 62.1 innings. During that 2014 campaign, Andrew got dealt to the Orioles at the trade deadline. The O's went on to the postseason that year and that was the first of five straight years of him pitching in the playoffs. He pitched for the Yankees in 2015 and then the Indians for the last three years. Andrew signed with the Cardinals during the off-season and is off to a rocky start. In just 3.1 innings of work in five games, he is 0-1 with a 10.80 ERA. It is still early, so hopefully he can get it going soon. I absolutely love this set and I was thrilled to get a card from it signed by a current player last season. There are not too many guys from this set still playing, so it is always fun when I am able to add to it.